As the Japanese TV channel WOWOW celebrates the playwright Mitani Kouki’s 50th birthday, so I thought I’d also do some posts on one of my favourite Japanese writers. In terms of style, his is a comfortable, easy-to-watch genre. He rarely pushes the boundaries in terms of social commentary or hard-hitting realism. Instead his works are meticulously structured, taking a situation and squeezing out every possibility without it seeming contrived or unlikely. It would not be harsh to call him sentimental. The endings of The University of Laughs, Radio no Jikan (Welcome Back Mr McDonald) and The Magic Hour are all the most touching you could expect. I've already written about his work before, so now here's the first in a short series of posts about some of his other films and TV series. Most recently, he wrote Wagaya no Rekishi. 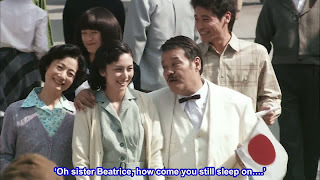 This three-part drama follows the adventures of a family in the latter half of the twentieth century, and as the years progress we see them getting caught up in the major events of that era. It’s an interesting idea, and a nice way to learn some recent Japanese history. The cast is full of famous faces, and the various periods of history are carefully recreated. But for something made with such care and attention, it's a little hollow. 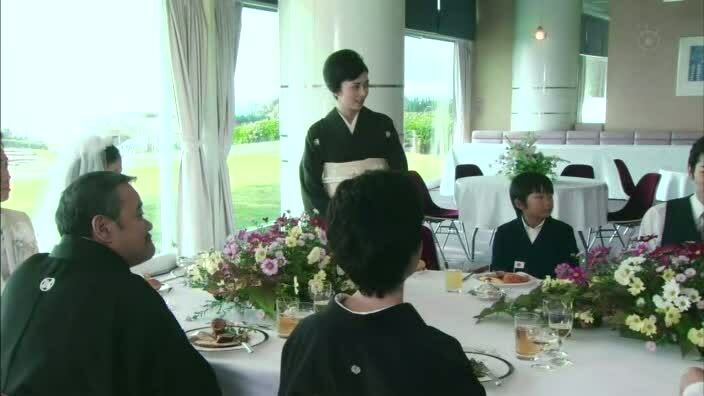 The problem is that some of the storylines are pretty convoluted as members of the family suddenly have to go to Hokkaido, for example, just so the story can include a particular historical event. Weaving a family history around the history of an entire country doesn't quite work. But the series has an epic feel to it, and it certainly feels like you've sat through a lot of modern history by the time you get to the end. And I mean that in a good way.